After hammering beaches from Corolla to Ocracoke Sunday, a coastal weather system delivered another round of wind and waves Monday before clearing skies and diminished winds arrived on Tuesday. High surf, however, was still grinding away beaches. N.C. 12 in Kitty Hawk at milepost 4 remained closed after waves overtopped an area that had been reinforced earlier this year with sandbags. Large chunks of asphalt had fallen away by Monday afternoon north of the repaired section. 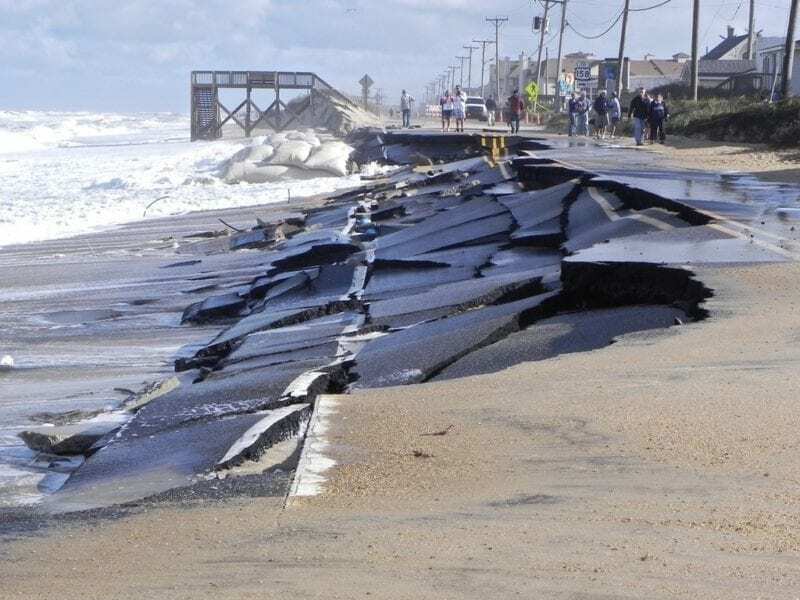 Other sections of N.C. 12 from Kitty Hawk to Hatteras had standing water and sand but were passable, according to the state Department of Transportation. Conditions started to improve Tuesday and the rest of the week promises to be cool with plenty of sunshine. Hyde County officials believe the worst of the flooding from a recent low pressure system has passed, although high water continues to linger, creating hazardous driving conditions. At present time all ferry routes serving Ocracoke Island are currently suspended due to inundation of roads. Visitor access to the island is still prohibited and will continue to be Wednesday, Oct. 7. A decision about allowing visitors to Ocracoke starting Thursday, Oct. 9 will be made Wednesday afternoon. An emergency shelter with showers and cots is open at O.A. Peay School, 1430 Main Street, Swan Quarter. Call 911 or the Hyde County Sheriff’s office for assistance.